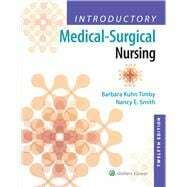 by Timby, Barbara Kuhn; Smith, Nancy E.
This updated 12th Edition of Introductory Medical-Surgical Nursing and its online resources equips PN/VN students with the practical knowledge and skills necessary to provide safe and effective nursing care to adult medical-surgical clients in today’s changing healthcare environment. This edition reflects current medical and nursing practice through accessible content enhanced by photos and illustrations that bring the information to life and reinforce learning. Online videos, animations, audio, NCLEX-PN® review questions, and much more combine with text content to prepare students for real-world nursing and NCLEX-PN success. Concept Care Maps present a visual diagram focusing on the priority problem, expected outcomes, and nursing interventions of the client in the accompanying Clinical Scenario. Critical thinking questions follow the scenarios. Over 30 Nursing Care Plans (with rationales) address such issues as Alzheimer's disease, cancer, myocardial infarction, stroke, diabetes mellitus, modified radical mastectomy, and chronic renal failure to help students develop a solid understanding of nursing care. Revised NCLEX-PN questions, as well as NEW alternate format questions, now align with the latest NCLEX-PN text plan. Nursing Process sections in each clinical chapter emphasize a nursing process approach to care and provide rationales in italics for all interventions. Nutrition Notes cover the special nutritional needs of clients with certain types of conditions. Pharmacologic Considerations highlight the special considerations students need to remember when caring for clients who are receiving specific drugs. Evidence-Based Practice boxes, including a Clinical Question, Evidence, and Nursing Implications, illustrate how research relates to practice. Gerontologic Considerations enhance understanding of how pathophysiology, signs and symptoms, and nursing care differ for the older population. Stop, Think, and Respond exercises increase recall and practical assimilation of concepts. Drug Therapy Tables list examples of generic and trade names, mechanisms of action, common side effects, and nursing considerations. An unparalleled suite of online Instructors Resources includes new LPN Concept-Based Curriculum Maps, test generator, image bank, QSEN Competency KSAs, syllabus, guided lecture notes, discussion topics, lesson plans, PowerPoint Presentations, LMS Course Cartridges, case studies, strategies for effective teaching, assignments, pre-lecture quizzes, and more.